With over forty years of experience in the industry, King Iron Works takes pride in the renowned personalities that have joined our list of valued clients through the years. Amongst the famous names we’ve had the pleasure of working with, many professional athletes have trusted the King Iron Works team with custom ironwork for their homes and businesses, ranging from luxurious iron doors and railings to unique wrought iron home accents, and everything in between. 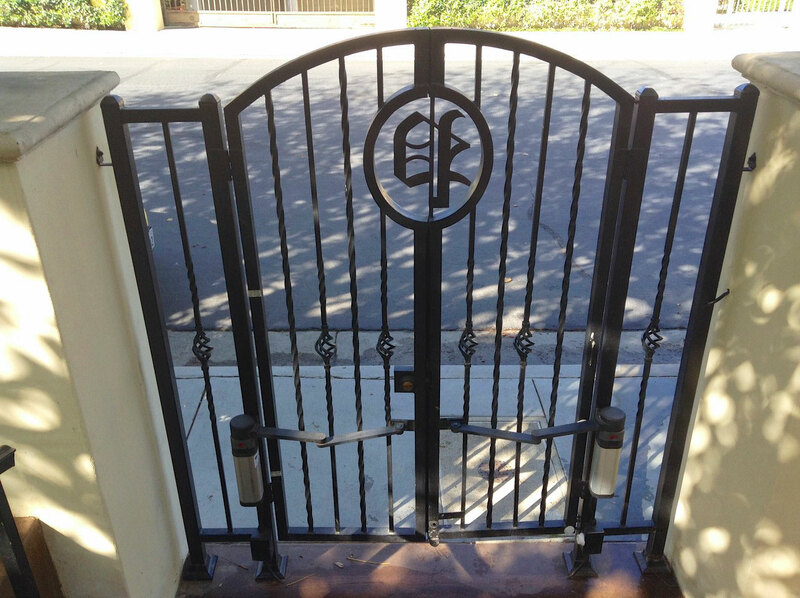 A few years ago, the King Iron Works team designed and installed a custom gate for Los Angeles Clippers star point guard Chris Paul’s Beverly Hills home. Paul has been a fan favorite since his entrance into the NBA in 2005. After making his mark as Rookie of the Year, his career on the court has only continued to escalate and expand his massive fan base. We have been watching Chris Paul make history for our hometown since 2011, when he joined the Clippers and helped revive the LA team. As huge fans of his, we were beyond honored when we were first approached about building a custom iron gate for Chris Paul’s home. We were recently invited back to change the functionality of this unique wrought iron gate without altering the aesthetic. The original gate was a sleek and simple design that featured the athlete’s initials, “C” and “P” on each gate. We had the pleasure of working with Paul Thornton, who was in charge of the project. Mr. Thornton provided us with the details and information we needed to make the changes to the gate as seamless as the original installation. The professionalism and organized structure of this project made the process enjoyable and successful for everyone involved. Whenever we are given a task, whether the focus is on aesthetic elements or operational aspects, our absolute priority is to make sure that the needs of our clients are always heard and met to best of our ability. When working with King Iron Works, clients and future clients can rest assure knowing that each step of the project will be clearly communicated for a smooth and convenient process and a satisfying end result. 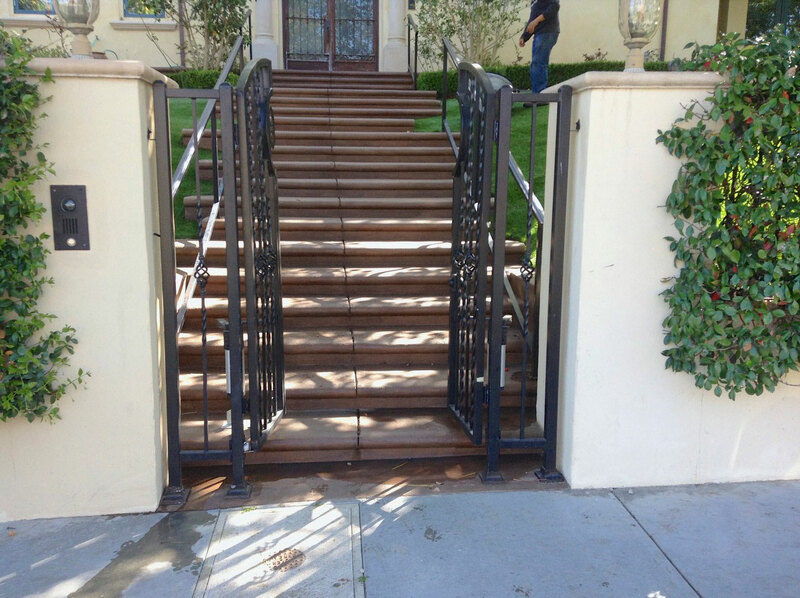 Many athletes, celebrities, and successful business owners choose to embellish and protect their homes with the addition of wrought iron doors, windows, railings, gates and other iron accents. Not only is the addition of iron a great choice for any home or business owner because of its strength and stability, but the luxurious visual appeal is also timeless and truly unmatched. Loyal clients have trusted and continue to trust the unparalleled workmanship and precision King Iron Works delivers each and every time. We take pride in the many time tested designs we have created based on the unique vision and taste of each client. King Iron Works truly exceeds industry standards by offering the finest quality handcrafted ironwork. Beautiful Los Angeles Cities from Beverly Hills to La Canada and beyond have been adorned by decades of King Iron Works’ designs and precise craftsmanship.